Half oppose statehood for Washington, D.C.
September 22, 2014, 1:54 p.m.
Last week a bill began working its way through the Senate that would make the current federal capital district a new state called &apos;New Columbia&apos;. Currently voters in Washington, D.C. do not have any voting representation in Congress, a sore point in a District whose license plates read &apos;taxation without representation&apos; to protest this injustice. The move for statehood is almost certain to fail, however, as Republicans worry that statehood would just deliver two new Democratic Senators to Congress. Washington D.C. is one of the most heavily Democratic areas in the country: in 2012 90.9% of voters cast their ballot for Barack Obama. The latest research from YouGov shows that only 27% of Americans support giving Washington D.C. statehood, while 49% oppose it. 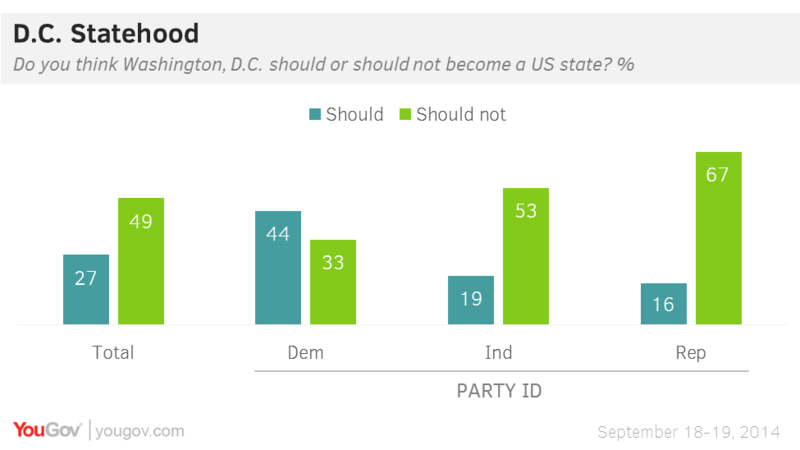 Most Independents (53%) and Republicans (67%) oppose D.C. statehood. Democrats tend to support (44%) rather than oppose (33%) Washington D.C. becoming a full state with a state government and full voting rights in Congress. Asked whether people in D.C. should be represented as voters in other states are, by a voting Representative and two Senators, Americans are nearly evenly split, with a little over a third supporting full voting rights for D.C. (37%), and a little under a third opposing it (31%) or simply being unsure about it (32%).